Release Date: September 15th, 2006 (Landmark Sunshine Cinemas) by Lionsgate Films. Directed by David Leaf and John Scheinfeld. BASIC PREMISE: A documentary about John Lennon’s transformation from a musician to an antiwar activist. ENTERTAINMENT VALUE: Directors David Lead and John Scheinfeld masterfully combine archival footage of John Lennon and his wife, Yoko Ono with current interviews of Yoko Ono and others, namely, Noam Chomsky and Walter Cronkite. 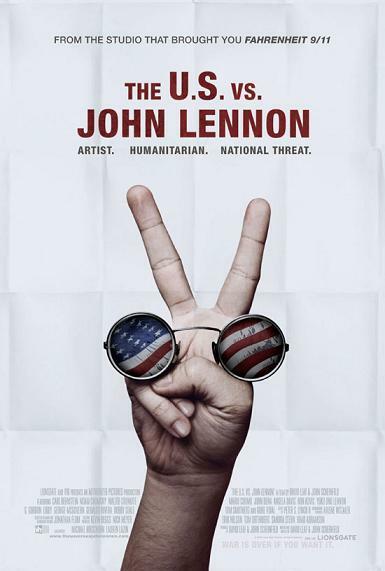 Much of the film is focused and drives the point that Lennon was against the Vietnam War and used his song lyrics as a means to protest the war—remember, all he is saying is to “give peace a chance”. True fans of John Lennon will undoubtedly be engaged by the many scenes with John Lennon, but, eventually, the scenes seem a bit redundant. It’s interesting how he fell in love with Yoko Ono who encouraged and inspired him to continue protesting the war. Meanwhile, the FBI watched him closely and he was almost deported from England. Unfortunately, there’s not enough analysis/exploration of John Lennon’s anti-war sentiments to make this a truly powerful documentary. Interviews with his fans would have helped to get more perspectives. By all means, it pays homage and celebrates Lennon, but it fails to be surprising and consistently fascinating. On a positive note, the production values, such as the editing, cinematography and sound mixing, are all exceptional and add some style to this mildly entertaining film. SPIRITUAL VALUE: John Lennon fans and those who lived during the his time will be moved just by watching the footage of him, particularly when Yoko Ono gives birth to his son on the same day he gets his green card. Unfortunately, there’s very little insight into Lennon’s way of thinking beyond the simplistic desire to give peace a chance. INSULT TO YOUR INTELLIGENCE: Occasionally redundant. IN A NUTSHELL: Mildly entertaining, well-edited and focused, but not compelling or insightful enough to be considered powerful.